How to Properly Maintain Commercial HVAC Systems | All Building Cleaning Corp. How to Properly Maintain Commercial HVAC Systems | All Building Cleaning Corp.
Property managers and building owners alike know how important their Heating, Ventilation, and Air Conditioning (HVAC) systems are. Repairs— or worse yet, replacements— of HVAC systems are among the biggest expenses you can have. The best thing any building manager or owner can do is have a smart maintenance plan in place to properly care for their commercial HVAC systems. Twice a year, your HVAC system needs a tune-up. Normally performed on the air conditioner in the spring and the heating system in the fall, this tune-up is a must to make sure they are working properly before the hot and cold seasons ramp up. If you hope to cut costs with your building maintenance, your HVAC systems are not the place to start. Routine HVAC maintenance is necessary to prevent more costly problems. If your heat goes out in the middle of a cold snap, you might require an emergency replacement of the furnace or parts, and all of that could cost a lot more if it happens on a weekend or in the middle of the night. The lifespan of your HVAC system will lengthen with routine maintenance, meaning you’ll go much longer without having to purchase a new furnace or AC unit. Monthly savings costs are also a benefit to routine maintenance. When the HVAC system is not performing at its best, it runs harder and consumes more energy. Typically, filters need to be replaced every three to six months. If your system can go six months, then your filters need to be replaced when you have them checked in the spring and fall. There are environmental factors that will necessitate the filters being changed more often. First, think about the climate your building is in. Do you have a temperate climate or do you have more extreme heat or cold? The more your HVAC system runs, the more often your filter will need to be changed. The type of building is a factor, too. Is it an apartment building? Do you allow pets? This will certainly increase the regularity of filter changes you need due to increasing dust, dander, and hair in the air flowing through the ventilation system. The more people that are in and out of your building will increase the need for filter change. If you own a factory where construction happens, your ventilation system will need a very specific plan for filter changes. Another factor to consider is outside pollution. In more rural areas, your filter could last longer due to lack of pollution. In more urban areas, the opposite is likely true. The type of building and climate you have are the factors you should consider when deciding what type of HVAC system you should have in your building. These are good for smaller commercial buildings because every room has its own unit. If one unit breaks, the other units will not be affected. However, each unit has its own outdoor unit, which can take up quite a lot of space. Most multiple split units can have up to nine indoor units connected to one large outdoor unit, which is ideal for limited outdoor space for units. But if one outdoor unit goes down, quite a lot of your building will be without heat or air conditioning. These are used for large commercial buildings and can provide different temperatures in the many rooms of your building. A backup unit is a smart choice when you have a VRF or a VRV. These do all need different types of maintenance done on them. The company you use for maintaining your HVAC system should talk to you about what kind of system you have and its specific needs. Maintenance is meant to fix problems before they cause a breakdown in your HVAC system. Many systems are belt-driven. If yours is, the seasonal maintenance will check on the belts to make sure they are perfectly in place and do not need replacing. If the belts are even slightly off their track it can cause them to wear down faster than they should, as well as put extra strain on the motor, causing the whole system to age faster than it should. Breakdowns that happen on HVAC systems need to be repaired very quickly. If it is the dead of winter and your building goes without heat, the problems can spread to pipes freezing, and other issues in the building costing even more money. If you own a multiple use building with retail or restaurants, or if you have a residential building, you’ll need to fix any HVAC issues immediately. Emergency service calls result in higher bills. Routine maintenance means parts can be ordered ahead of time and not in an emergent time, costing less than when you need parts at once. While your commercial cleaning company may handle ductwork cleaning, that does not go far enough in the maintenance of your HVAC system. 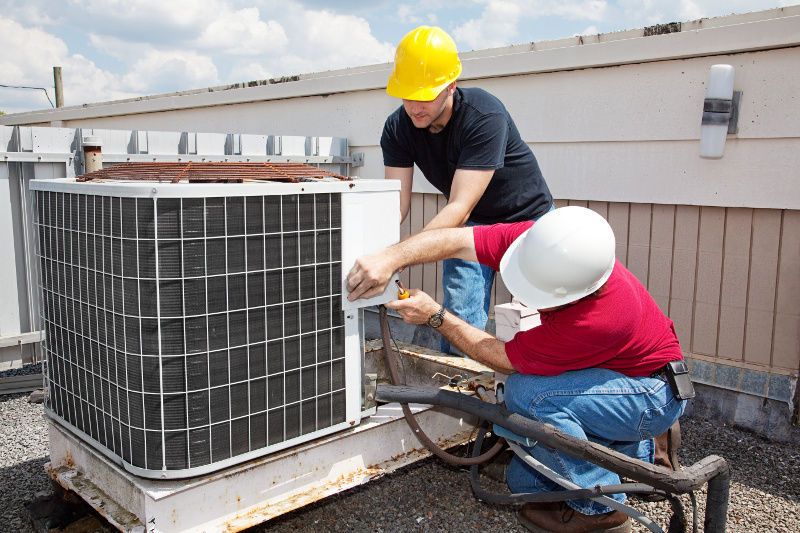 HVAC system maintenance companies will go into your actual HVAC equipment, take it apart, and check the parts. They will tell you what replacements you need and conduct a thorough cleaning of the mechanical side of the system. When you consider a commercial cleaning company, be sure to discuss the type of system you have, the type of building you manage or own, and the type of environmental factors that may affect your specific system when coming up with a plan for your HVAC system maintenance with them. This article was contributed by Air Tech, a Virginia-based HVAC contractor.